I have written several times before about supply chain visibility, and where it will lead us. One of the main reasons why visibility will be such an important issue for the foreseeable future, is because third-party logistics (or 3PL) will become more and more important. So, I hear you ask, what is this 3PL? And why would it become more important? And, last but not least, why would that imply that supply chain visibility would become more important? I will write about those last two questions in a next post; this post will concentrate on an explanation of 3PL and its advantages (and disadvantages). You use your own transport, sending a truck (owned or rented) with the shipment from your central warehouse to the project. As you are the ‘first party’ in the shipment, this is known as first-party logistics or 1PL. You contract a transport company to ship the goods to the project, based on a contract and a waybill. The transport company (or as loggies like to call them, the carrier) is also known as a ‘second party’, and hence this is an example of second-party logistics or 2PL. Most likely you now have an idea where this is going, but let’s spell it out anyway. Instead of having your own warehouse and trucks, you could have an external provider organise all this for you. You only need to tell the provider that a shipment made up of so many of this item needs to go to that project, and they take care of the rest (at a price, of course). A provider who offers this sort of multiple, integrated services, is called a third party and (you guessed it) this is an example of 3PL. 3PL providers come in all kinds, some offering a wider array of services than others; some very familiar ones are international couriers and international postal services, and freight forwarders: all three offer to organise your shipment across a variety of carriers and often (but not always) include clearing services. Needless to say that there is actually an animal called fourth-party logistics (or 4PL), but I will leave that one for another day. 3PL providers are specialised in integration of links in the supply chain, and they can levy much more expertise in this field than any aid or global health organisation ever will be able to. They know the markets to the last digit, have extensive knowledge of and experience in integrated supply chains, and have seen the same issues crop up over a variety of organisations – and know of many techniques to overcome these issues. 3PL providers can leverage economies of scale through combined facilities and shipping at much larger scales than any but the biggest aid and global health organisations, potentially providing better efficiency. 3PL allows for easier up and down-scaling: as our needs change, we can just use more or less of the provider’s services, instead of having to deal with a restructuring of our organisation (including possibly painful measures like lay-offs, or, conversely, having to go through expedited hiring of new staff, with all kinds of risks attached). 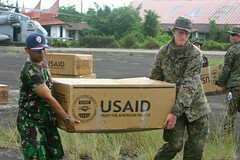 3PL by the US and Indonesian armies on behalf of USAID. Aid and global health work often takes place in places and markets in which 3PL providers have no or very little experience, which might mean that their general expertise does not add that much value. In some contexts in which we work, 3PL providers (and, indeed, 2 PL providers) do not operate because of security constraints. Specifically for humanitarian aid, it is important to adhere to standards of neutrality and impartiality; it can be difficult to verify that 3PL providers do so, and the added limitations could mean that they are not able to offer any increased efficiency (e.g., it implies some limitations regarding combined cargo). In case of disaster response, many 3PL providers would have difficulties dealing with the damaged and overburdened infrastructure, which aid organisations have much more expertise in. Yet, taking all this into account, I still foresee that we will use more and more 3PL services. Stay tuned to read why. Very informative and a great explanation of the different kinds of PLs.